Bring warmth and comfort to your bedroom or sofa with this reversible throw. The throw can also be used as a plush blanket for extra comfort. Made from polyester, it is soft and machine washable for quick care. I purchased the tan and green throw and love the colors. It is really soft to the touch and doesn't collect lint. Highly recommended. Other than taking quite a awhile to receive, this blanket has to be one of the softest blankets I have ever had. We ordered a king size and it's true to size. 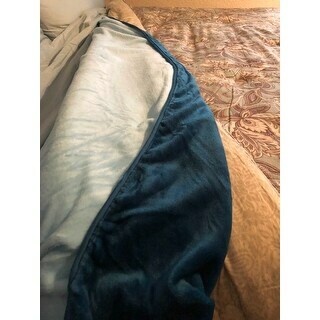 We use it as a top blanket on our bed and it provides so much extra warmth for the winter. Very nice blanket - don't hesitate to purchase. We cannot sit on the sofa without a blanket. Love these throws. I ordered the red and tan color. The colors are vivid and the red is perfect for me. They are really soft as you would expect......I did not expect them to be so light. They are light weight yet warm and soft. I will buy again. The price can’t be beat. very soft and plush, reversable is nice too. Love it. 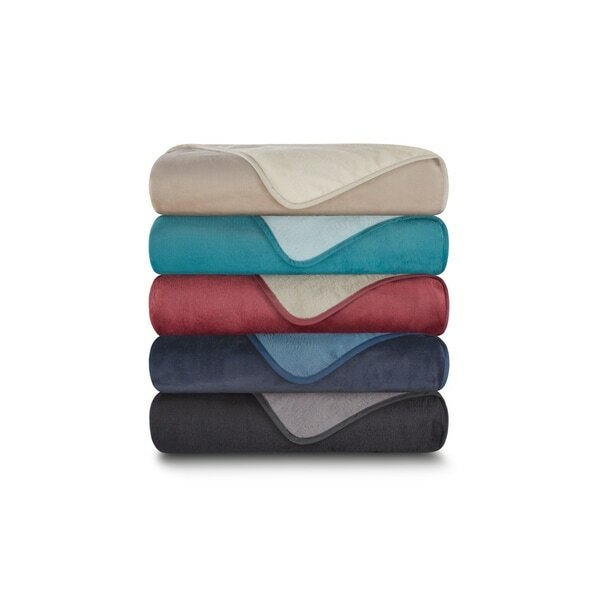 This reversible plush blanket is so luxurious feeling. I am very pleased with it. The color is great and such a vivid color, too. I am using it on my guest room bed and will probably order another one just for me. The material is so very soft and comfortable and is perfect to snuggle down for a nap or a good book to read. I think it is absolutely great. Good large size , soft and warm. Not very heavy but will keep you toasty. Every guest that snuggles up with this throw is in heaven. The only mistake I made was ordering the same size as the bed. It would be better to have a smaller throw since it's for using on the top of the bed or on the couch. Kept it but my daughter stole it from me, so cozy! Everyone loves the plush blanket. It's very soft and warm. Thanks! Don't dare try to fluff this. Full of fabric pills. Spent hours grooming it. Bought 3 different shavers and pill removers. Gave up today and tossed in the bin to be picked up on Wednesday. My husband loves these blankets. Warm, fuzzy and sturdy - we fight over this one in my house! This blanket is well made. It is very soft and large. It will definitely keep you warm at night. The blanket was well packaged when it arrived on a sturdy hanger in a very heavy plastic bag. I will definitely be buying a second one. Love these blankets Sots washed VERY NICE, both my kids asked for one on there beds! Would definitely buy again Highly Recommend. Love it! Colors are as pictured. It’s soft and cozy and not too hot!! The teal color is more blue than teal. A little disappointed, but otherwise a nice soft blanket. Just as expected,perfect for what I wanted. "Is this two layers bound together or one layer with a color on each side? " "Would you be able to monogram on this ?" Great blanket! You could try but I wouldn't suggest it with the material that it is. I would be afraid it would ruin it. "What is the weight of this blanket and is it thick?" This is 2 LBS. It's normal size not extremely thick. "What are the measurements for the throw?" The measurements are 50 X 60. Because it's reversible and it goes with the decor in my room.